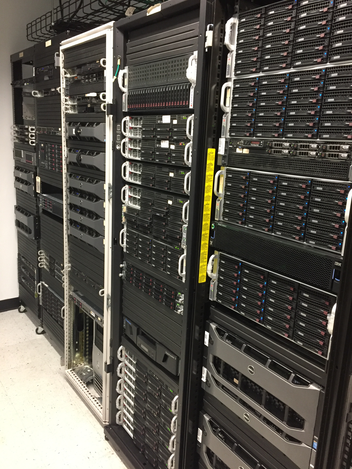 The Center for Genome Research and Biocomputing maintains an extensive and well-managed infrastructure consisting of a distributed service architecture, a greater than 5000-processor computer cluster and a secure private 1G/10G/40G network (see figure 1). Each machine has internal hard drive disk space for operating system ans scratch, but is also connected to 4.5PB of NFS shared disk space. The CGRB encourages high-volume users to contribute to the computational infrastructure. Users are charged $55, $102, and $150 per/month for maintaining each processing machine, web/database server, and file server, respectively. The nodes are provided at the highest priority to the specific project and provided upon request at a lower priority to other CGRB researchers. Thus, subsets of cluster nodes are dedicated to specific research projects, but they function as part of a unified cluster when needed for intensive jobs. This priority-based scheduling has proven quite successful, both in terms of end-user satisfaction and in the execution of systems administration activities. Computational requirements are constantly re-evaluated and new hardware is integrated as needed. The CGRB maintains an active biocomputing group consisting of full-time staff. Christopher Sullivan serves as the CGRB systems administrator and has extensive expertise in all aspects of hardware and infrastructure design and maintenance. Christopher also has experience in software development and bioinformatics applications. Matthew Peterson maintains CGRB data flow from the Core Lab. Dr. Shawn O’Neill, in addition to participating in research projects, also serves as a bioinformatics trainer. Dr. O’Neill offers training courses in computer programming, runs topical workshops, facilitates peer-to-peer training, and runs the OSU bioinformatics users group. Dr. Kronmiller serves as a bioinformatics consultant. The efforts of the CGRB biocomputing group are directed towards facilitating biological research through the use of computational tools. Projects span from CGRB Core Labs ordering and data management software to developing tools and procedures for analysis and distribution of high-throughput DNA sequencer data. The CGRB computational groups continually works to lower the activation energy needed by researchers to take advantage of the computing resources and creates new tools to help this process. Finally, the CGRB bioinformatics group actively foster collaborative projects with University faculty associated with the Center. Figure 1. Overview of CGRB computational infrastructure. The campus network is public, whereas the CGRB maintains a completely secure private network. Individual machines support specific duties within the infrastructure; for example, dedicated MySQL servers and a dedicated web server. Specific subsets of nodes within the Genome cluster are dedicated to specific projects; for example, the RNA and Fungi sub-clusters. Note that the Private Network Switch represents multiple physical units.